From mining operations to industrial inspections, here’s how drones are making dangerous jobs safer than ever. Drones are becoming the next big thing in industrial inspections, surveying and even scientific explorations. But can they inspect wind turbines, offshore oil platforms and even ice caves? Absolutely. Utilities companies, in particular, are saving time and money with commercial drone applications by more efficiently monitoring and maintaining their assets. As a result, drone inspection services are set to be a billion-dollar industry. In a 2016 report, PwC estimated the potential marketing for drone solutions in infrastructure to be over $45 billion. Beyond money and time-saving opportunities, utilities are eager to employ drones to mitigate hazardous operations and decrease workforce injuries. This technology is providing engineers with real-time data, images and post-inspection analysis, resulting in a shift away from traditional utility inspection methods. Using real-time operational insight and in-depth data access, operators can quickly make time-sensitive decisions accurately, and quickly identify areas of concern in hard-to-reach locations. One such story begins in Switzerland. The start-up drone manufacturer, Flyability, is developing an industrial inspection drone. But this is no average drone—Flyability’s drone was designed to navigate and map tight, perilous spaces. It’s also ideal for scientific research of extreme environments. In 2016, the sturdy drone was equipped with a thermal camera to explore and map caves and geological formations under Sicily, Italy. Flyability also highlights their drone’s capability as a search and rescue tool in environments that are too dangerous for humans to traverse. 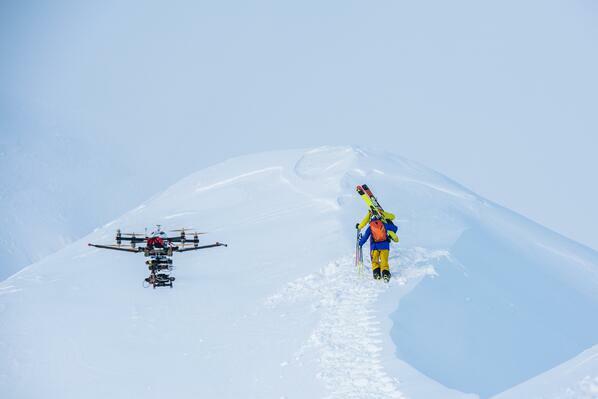 The technology company recently partnered with the Swiss Alps mountain rescue team to both offer their services and demonstrate their drone’s ability to navigate treacherous environments. Outfitted with an HD camera and powerful lighting system, the drone was dropped into the deep, dark, narrow core of a glacier—and came back out in one piece with the video to prove it. Typical mining responsibilities such as surveillance, monitoring and maintenance are monumental tasks, and current approaches are both capital and labor intensive. Today, drones are taking the mining industry by storm. With such powerful data collection and versatility, they have great potential to improve efficiencies and costs throughout the mining industry. For instance, they are far less expensive than helicopters, which are traditionally used by the mining industry to attain an aerial perspective. Also, they can provide mapping abilities that deliver better results and drastically improved data for a fraction of the cost. In addition to mapping construction, UAS can be used for a variety of mining tasks, including stockpile volumes, monitoring blasts, surveying mine progress and landscape changes, exploring for minerals and building digital elevation models. Not only are drones making mining operations more efficient and less expensive, but the infamously dangerous profession can also be made much safer by employing UAS to function as a less invasive exploration method. Drones are assisting in the safe exploration and inspection of inaccessible, dangerous, complex or confined spaces. Using UAS technology coupled with an operational intelligence platform, drones can perform typical industrial inspection tasks at lower cost, risk and infrastructure downtime. OI delivers the situational awareness needed to enable UAS operators to operate safely and efficiently in congested airspace. Simulyze’s OI technology provides UAS operators with real-time data insight accessed from anywhere, in any format to offer a common operating picture (COP), which enables well-informed decisions. OI’s data gathering, mapping, image capture and data analysis capabilities are set to transform traditionally dangerous operations for the better.